Look no further for professionally taught software training. This is a hands-on software training that is perfect for anyone wanting to learn more about software and digitizing. 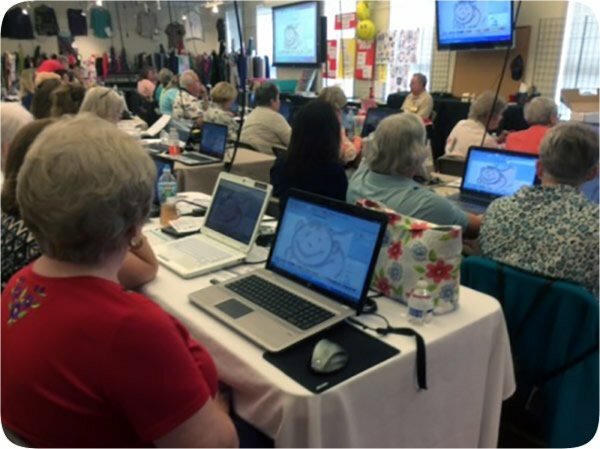 The wonderful tips, tricks, and expertise shared at this event will help enhance your embroidery software experience for owners and non owners alike. Our one day class will cover basic features, editing, applique, digitizing tools, advanced editing and more! No matter your level of experience, receiving Floriani software training from a Floriani Educator is an experience you won’t want to miss! Each event has two days for attendees to choose from! Learn how to use your software to its fullest potential! Darlene Pollard will be coming back and we are SEW EXCITED!!! This is a one day class. Sign up for the date you will be coming. This class will be held at our retreat center at 6599 South Transit Road, Lockport. It is right next to Fabric Warehouse by the Drive-in. You can bring your laptop and wired mouse to follow along with the class. If you do not have one please let us know, we do have some available to use. If you do not own Floriani software we will load it on your computer to use in class. Floriani owners will receive a gift certificate for $20 to spend at the event.